A modern take on the traditional cross, the stainless steel Personalized Black Wrap Cross Pendant is ideal for those who enjoy a contemporary look. 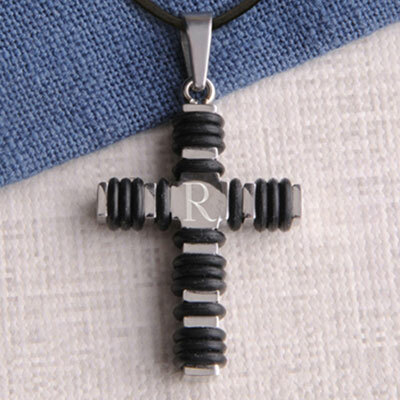 This no-tarnish cross is wrapped in thin black bands and includes space for single letter personalization on the front. A great gift for a special occasion! Includes a versatile, black leather necklace, expandable up to 35-inches. Measures 1 1/4" x 7/8" x 1/4". Personalize with a single initial. 1 1/4" x 7/8" x 1/4"